Enermax shows off the U.R. VEGAS, a new 120mm USB fan with 18 red LEDs and 7 light effects. The fan features a special magnetic skin pad, providing mobility and flexibility by enabling you to attach it wherever you need extra cooling. The U.R. VEGAS will arrive in July for around $20. Think outside the case. Cooling fan is no longer stationary and hidden inside the case. U.R.VEGAS breaks the rule by special designed magnetic skin pad and USB power. U.R.VEGAS provides mobility and flexibility with its magnetic skin pad. 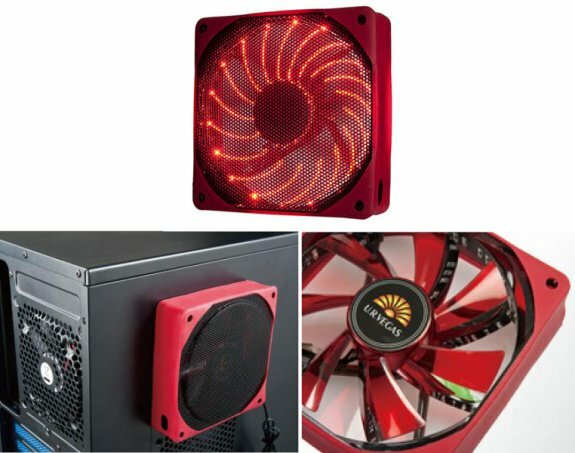 It can be attached onto case and moved easily to anywhere that needs extra cooling. With 18 LEDs, the U.R.VEGAS not only shines 4 times brighter than other fans, but also has 7 switchable lighting effects for users to enjoy the fabulous light show. U.R.VEGAS features patented Twister Bearing, which is a magnetic bearing type that does not deteriorate from abrasion like mechanical bearings, such as Sleeve or Ball-Bearings. Twister Bearing fans have long MTBF of 100K hours and low noise. For the safety purpose, a stylish fan guard is included with the package.